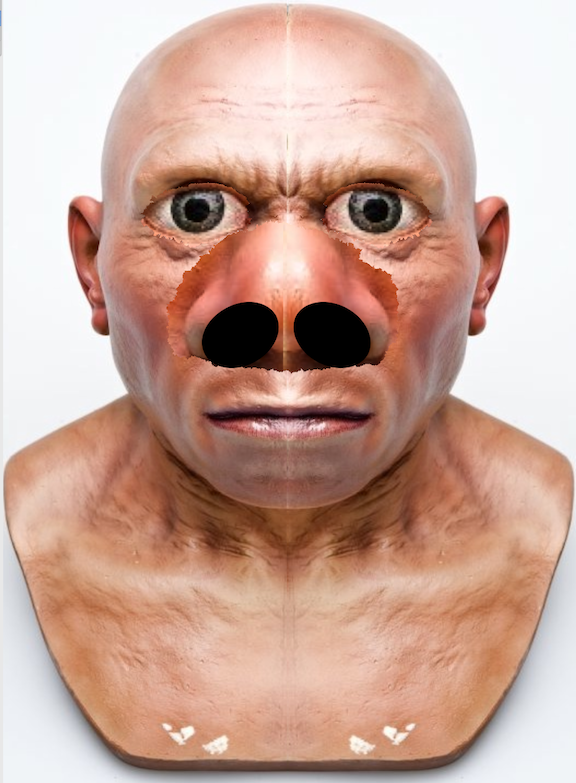 Relative to my previous posts* on the subject of the Neanderthal face, I’ve had an epiphany in the last couple of days. So, I thought I’d do a wee comparison between a modern day “top” carnivore and our cousin’s, the Neanderthal, face. Do you see what I see in the image below? 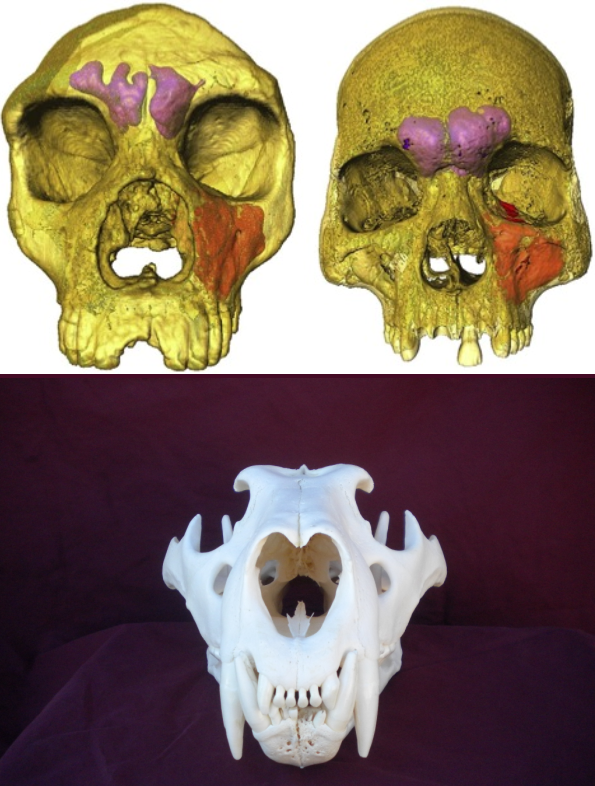 It looks as if the felid and the Neanderthal face have more in common than either has with the modern human. The lion has a keen sense of smell. Which of the bipedal cousins do you think has the better sense of smell? Relative to the rest of the face, the big cat has a nasal aperture that’s equivalent in size to that of the Neanderthal. Not so that of the modern-day hominid on the right. The cat has dagger-like fangs and molar teeth that would put a deli meat-slicer to shame. “Aha!” you might say, “that chap from Forbes quarry couldn’t be as effective as the lion–it doesn’t have the appropriate dental accoutrements!” Umm. It’s possible, isn’t it, that all those flint flakes lying about came in handy for more than whittling? To my (admittedly impoverished compared to a carnivore’s) eyes, it’s as clear as the nose on your face day that the Neanderthal was well adapted to carnivory. I’ve been accused before now of beating a dead horse. Is the “Neanderthals-are-just-like-us” horse dead yet? Interesting to see someone else had a similar line of thought concerning Neanderthal skull morphology. But is this the case? 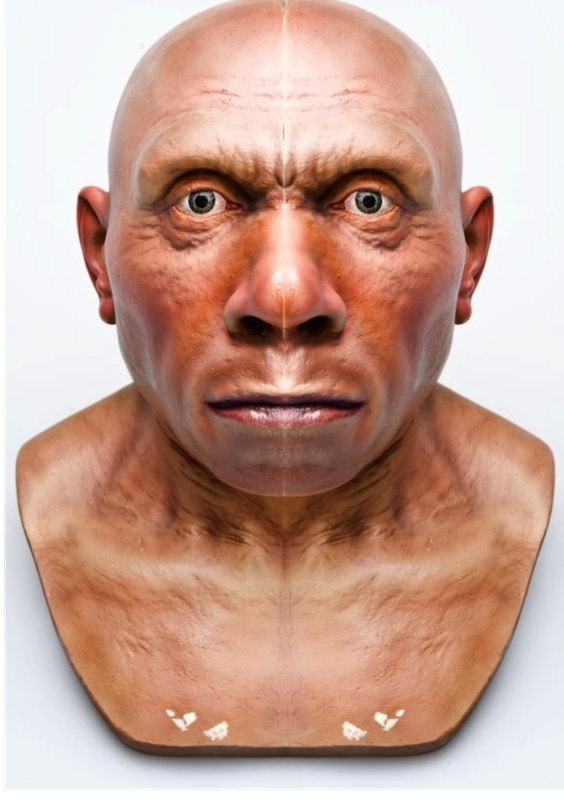 Ironically scans of Neanderthal brain casts seem to indicate that these ancients had SMALLER ofactory lobes than H Sapiens as well as a slightly different inner ear shape.